The village of Woods Hole in which WHOI is located is a part of the town of Falmouth, which is located on the southwest corner of Cape Cod within Barnstable County. Most WHOI employees live in the town of Falmouth. Falmouth is bordered on two sides by large bodies of water, Buzzards Bay to the west, Vineyard and Nantucket sounds to the south, and bordered on the north and east by the towns of Bourne, Sandwich and Mashpee. These communities, including Falmouth, make up the area known as the Upper Cape. The town of Falmouth contains eight villages: Falmouth Center, East Falmouth, West Falmouth, North Falmouth, Hatchville, Teaticket, Waquoit and Woods Hole. Each village has its own post office and four have elementary schools. Falmouth is a well developed but rural coastal town with a winter population of about 31,905. The resort appeal of the area pushes the summer population to over 93,000. Falmouth contains about 49 square miles, including 1740 acres of freshwater ponds and about 1500 acres of sheltered salt water bays and harbors. Twelve of the town's 68 miles of seashore are sandy beaches where the mean tidal range is two to four feet. Like much of Cape Cod, Falmouth owes its geologic character to glaciers which melted away some 12,000 years ago. They left behind a backbone of moraine--low-lying hills of glacial debris--running from Woods Hole to North Falmouth, generally along the route of the main highway (Route 28). To the south and east, sloping toward Nantucket Sound, is outwash plain, formed of sand and silt carried seaward by rivers from the melting glaciers. As it built up, the outwash plain was furrowed by these rivers into what is now the series of long, narrow salt ponds along the south shore of the town. 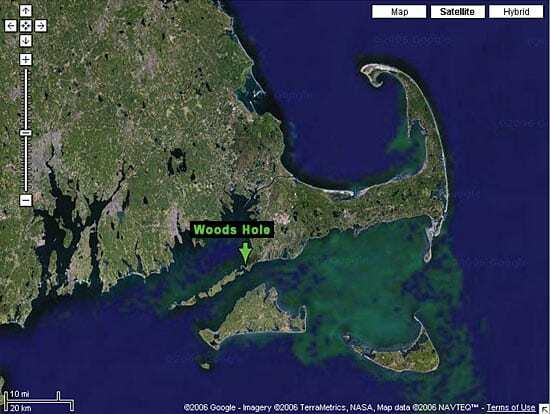 Throughout Cape Cod, the landscape is dotted with small ponds or "kettle holes"-- depressions caused by isolated blocks of glacial ice that eventually melted away. The coastline has been changed since glacial times by rising sea level and the ongoing action of waves and coastal currents. Falmouth's climate is influenced by the temperate climate of southern New England, made more moderate by the surrounding ocean which prevents extremes of heat and cold. 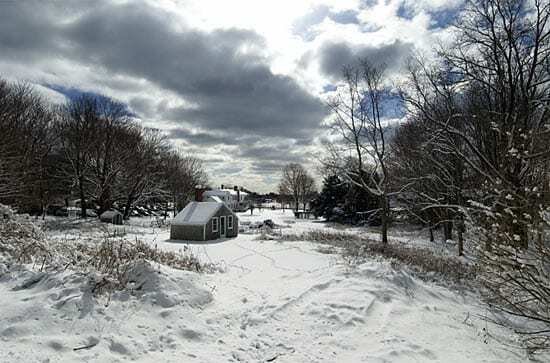 New England winters are quite cold (December - February) with daytime temperatures often dropping below 32ºF (0ºC). Winter and spring snowfall annually averages two feet, but snowfalls are often mixed with rain and deep accumulations are unusual. During cold weather you will hear reports about the "wind chill factor." The wind chill is the temperature of still air that would have the same effect on exposed skin as a given combination of wind speed and air temperature. The lower the air temperature and the stronger the wind, the lower the wind chill factor. Wind chill factors below 10ºF (-12º'C) are relatively rare, but they do occur. To be comfortably dressed in the winter (November to March) you will need warm outer clothing and boots. Unless you own these items, it is usually easier and more economical to purchase winter clothing after you arrive here. For a list of retail stores in the Falmouth area see the section on shopping. Good quality used clothing is available at lower prices especially at exchange shops (operated by churches or hospitals), and used clothing stores. In summer the average temperature of both land and sea is 65ºF to 75ºF, and there are usually three to five days of fog each summer month along the shore. Lightweight clothing is appropriate for the warm, humid summers. Except for the rare tropical hurricane in late summer, the most severe storm is the Northeaster which brings heavy rain and high winds and tides in any season.